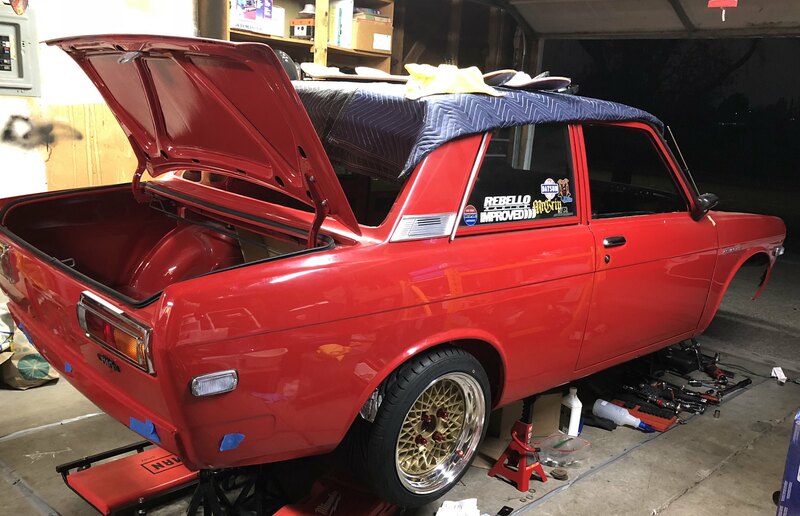 What did you do on your 510 today? 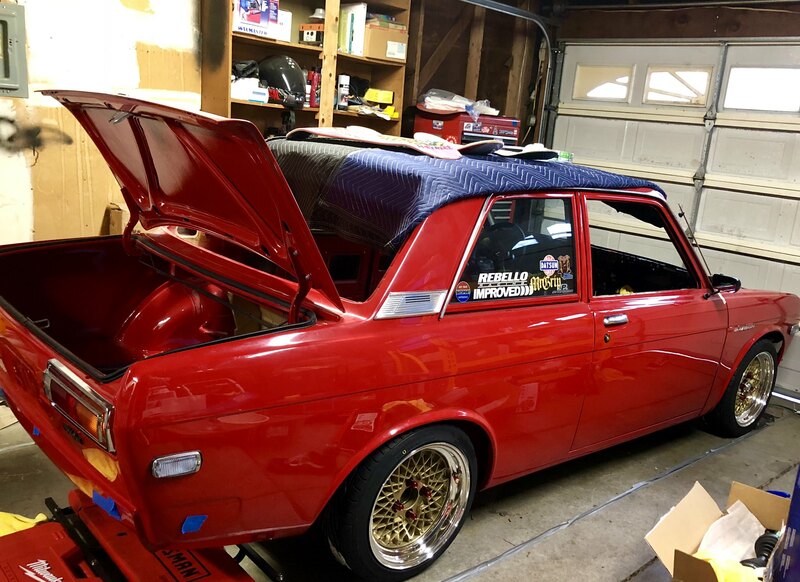 Re: What did you do on your 510 today? Looks fantastic! Those dapper lights have the halo or angel eyes effect? Thanks Greenthumb they do have have the halo rings. finally got the car off the jack stands this weekend. It still needs to have some suspension adjustments. But good enough for now. Mounted the rear cross member today and rear coils. Need the car on the ground to make room for my wife's car. Put on the rear wheels as well. I need to set the ride hight once I get the front suspension buttoned up and wheels installed. Where’d you get the qa1’s? Got them from here at DPracing. Nice! These wheels are 3 piece AME wheels, which are actually made by Enkei. They were only offered in Japan as there luxury brand. Not today, but I have finally primed my engine. I did try to start it, but it didn't fire up, I think there is something wrong with the coil, or with my knowledge, couldn't get a spark either way. Unlike our poor compatriot above me, my car started on the 2nd crank, which surprised the hell out of me, it was 39F (4C) in the garage. My new storage garage, not that I'm complaining, has the attic hatch right above my car. So, when my daughter or son-in-law need to remove anything, or, in this case put the Christmas decorations away, I need to move the car. At that point I then need to let it run and bring it up to 200F. to eliminate any water/condensation. 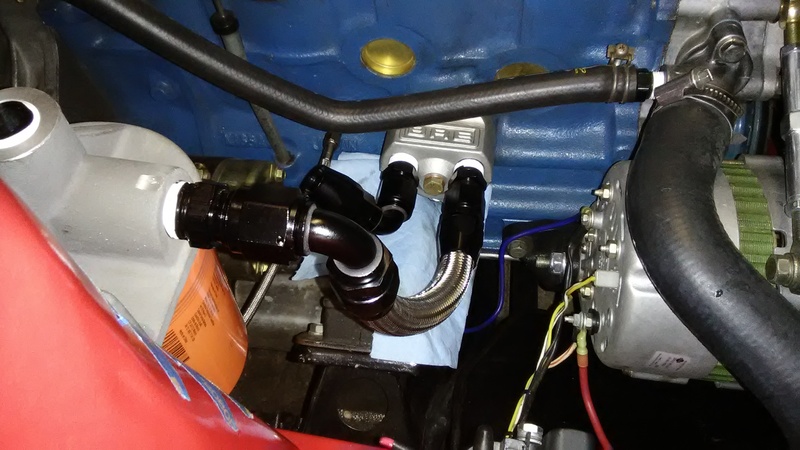 As I have no choke I just let the float bowl fill up, give the throttle a 1/2 dozen good blips, to get the accelerator pump dumping a good slug of fuel in there, let it sit for 30 seconds to try to evaporate in the cold, then hit the starter. Wham, it virtually lit off with two cranks. I cycle all the relays, fan to high, wipers, lights, just to keep things moving. After 15 minutes slide the car back into it's slot and now can be good till spring. 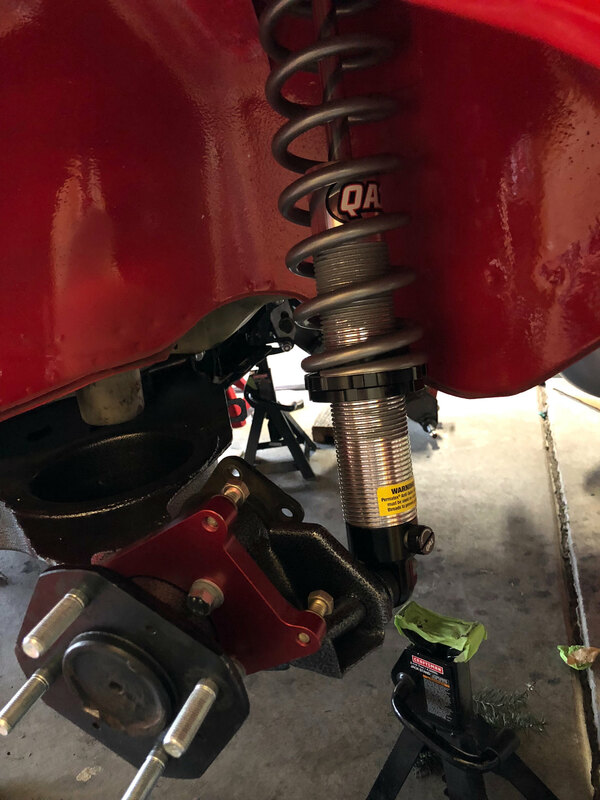 Installing a remote oil filter mount. Last week I got the filter mounted on the strut tower with the Traco mount. Today I installed the BRE remote filter block adapter and assembled the oil return hose. Bolted on new wheels... New vto installed. Over inch clearance to wheelwell on rear and about 3/16 to control arm.. I think with a modified arm 225s will fit..